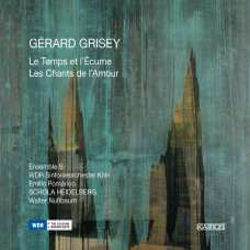 Both the works by Gérard Grisey presented here are new to CD. This release should therefore perhaps be of special interest to listeners in the UK, where neither work has been performed and where performances of Grisey's work in general are thin on the ground. With the UK premiere of Les Espaces Acoustiques coming up in October though, courtesy of the London Sinfonietta conducted by George Benjamin, Grisey's stature here only looks set to grow over time. The originality and depth of his compositions certainly warrant their due recognition, and there is no reason to see why this shouldn't be forthcoming with audiences allowed the chance to hear them. Grisey's work displays an approach to music and its compositional material that is primarily marked by the twin consideration of time and duration. These factors, implicit to all sonic material, were previously left out of those systems fashioned by the dominant compositional schools of thought in Europe coming after the dissolution of common practice tonality (Schoenbergian serialist and 1950s Darmstadt post-serialist). The renewed focus on harmonic structure in spectral music brings with it a return to those factors of consonance and dissonance, of tension and relaxation, that were the defining features of tonal form. Although the norm in these isles is to consider the execution of this compositional thought too excessively theoretical to warrant proper attention, that attitude shouldn't last too much longer with a newer generation of composers to replace that older one that grew up with serialism considered as the only serious method available to a contemporary composer. Les Temps et l'Écume ('Time and Foam') begins this disc with low, ominous repetitions in the bass instruments and trembling in the percussion, repeated waves of which building up, their expansion then drawing out the other higher instrumental sounds, extending in scope until the waves they describe begin to cohere into sharp, harsh harmonies, the impression made being of slow, elongated motion underwater, or as shown to the senses through a film of fog. The 'foam' that is produced on these waves is harmonically based and sears through the bass rumblings that precede and produce it. The process enacted here is easily observable and provides the formal definition of the piece, the patient description of an object in sound, a sound object. Two synthesizers supplement the acoustic sources in an unobtrusive, complementary way, the piece's harmonies gradually becoming more fervent in brass and winds and the waves heavier, their residue littering in percussive branches. The percussion writing here brings to mind the last section of the same composer's work for percussion ensemble, Tempus ex Machina (and also the film Predator, bizarrely enough). Melody intrudes around nine minutes in with smaller waves occurring, the same wave at a higher tempo. The overall timbral mastery on display in this composition particularly impresses, the chamber orchestra cohering in a rich and complex formal tableau, enabling the presentation of that process in which harmonies and melodic fragments act as figures and forces, swept along in a tide. Debussy, mentioned in Grisey's programme notes, is a natural reference here, in the structuring use of timbre. Varèse is another, and around thirteen minutes in on the recording there is what appears to be a deliberate homage – a series of fractured, repeated same-pitch interjections swapped between different instruments before another introduction of swirling chords kicks in, this time parallax to some upward-climbing clarinets in a faster tempo. The object throughout this work is the concurrence of different times and tempi, something Grisey began to work on with Epilogue and further developed in Talea. The attention on this recording though definitely lies most strikingly with the massive harmonies on display, which are only restrained enough to make them appear as menacing as possible. The playing of Ensemble S and the WDR Symphony Orchestra Cologne is impeccable, and it is hard to imagine the piece played with a better understanding of exactly what is required in terms of tempo and that ensemble timbral writing that Grisey displays here to such an advanced degree. This type of work is easy enough to get wrong (as shown for example in Boulez's recording of Grisey's Modulations) but the realisation documented on this disc is excellent. The second piece on the disc, Les Chants de l'Amour, was completed in 1984. It was Grisey's first large-scale vocal composition, and here the dramatisation of musical material that occurs throughout his instrumental work is very overt, within the context of a 'music theatre'. With its chattering and countrapuntal vocals, for the most part unintelligible, this is a work that, if any, serves to belie the usual thought that spectral music simply corresponds to an over-technical extravagance of harmony. What is shown again here is that power of description that was a major concern of Grisey, and which explodes in a piece that does not rely on any stereotypically 'spectral'-orchestral tenets. References points are mentioned in the programme notes and spring to the ear readily – the polyphony of African pygmy music, the vocal music of Ockeghem and Dufay, Stockhausen's Stimmung. One perhaps unlikely likeness is with the late work of Feldman, and such pieces as Coptic Light, where there is also to be found an ongoing, processual repetition of cells, minor alterations denying any mechanical identity (this method was displayed by Grisey as early as Prologue). The technical proximity of these two composers is of course open to conjecture, or further exploration. Schola Heidelberg here takes on the performance, conducted by Walter Nußbaum. Their repertoire ranges from ancient music to the commissioning of contemporary music from composers such as Helmut Lachenman, and they boast a masterery of the myriad vocal techniques required of these collective poles. That range is on generous display here and you get a sense of their relishing the opportunity to exercise it. The delirious swirl of the music admits the listener of many musical reminisces, traversing a span of different spheres of the mind of its anonymous incipient – a growling, electronically generated voice, a tape part generated at IRCAM, at play throughout with the human voices of the ensemble. This is a work 'dedicated to all the world's lovers', and its mellifluous flow creates an arch amatory chaos, ordered carefully as usual by Grisey. Towards the end the piece develops into a slow breathing in the electronic tape part leading into one of the more memorable parts of this piece, a soft, two-chord, slow oscillation, accompanied by a wavering alto voice fading in and out, which develops into a beautiful quarter-tone melodic line. Grisey refers to this brief section as a lullaby, and the piece thereafter ends in a reversion to the electronic voice, and what is presumably its dream – the world babbling with information, the last logical place the piece can go in returning us, the listeners, to ourselves.